"Magnetic south" redirects here. For other uses, see Magnetic South (disambiguation). For additional general information about the Earth's magnetic poles, see North Magnetic Pole. Locations of South Magnetic Pole from direct observation and model prediction. The South Magnetic Pole is constantly shifting due to changes in Earth's magnetic field. As of 2005 it was calculated to lie at 64°31′48″S 137°51′36″E﻿ / ﻿64.53000°S 137.86000°E﻿ / -64.53000; 137.86000, placing it off the coast of Antarctica, between Adélie Land and Wilkes Land. In 2015 it lay at 64°17′S 136°35′E﻿ / ﻿64.28°S 136.59°E﻿ / -64.28; 136.59 (est). That point lies outside the Antarctic Circle. Due to polar drift, the pole is moving northwest by about 10 to 15 kilometres (6 to 9 mi) per year. Its current distance from the actual Geographic South Pole is approximately 2,860 km (1,780 mi). The nearest permanent science station is Dumont d'Urville Station. Wilkes Land contains a large gravitational mass concentration. 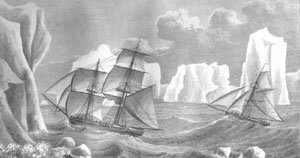 Early unsuccessful attempts to reach the magnetic south pole included those of French explorer Dumont d'Urville (1837–40), American Charles Wilkes (expedition of 1838–42) and Briton James Clark Ross (expedition of 1839 to 1843). The first calculation of the magnetic inclination to locate the magnetic South Pole was made on January 23, 1838 by the hydrographer Clément Adrien Vincendon-Dumoulin [fr], a member of the Dumont d'Urville expedition in Antarctica and Oceania on the corvettes "L'Astrolabe" and "Zélée" in 1837-1840, which discovered Adelie Land. On 16 January 1909 three men (Douglas Mawson, Edgeworth David, and Alistair Mackay) from Sir Ernest Shackleton's Nimrod Expedition claimed to have found the South Magnetic Pole, which was at that time located on land. They planted a flagpole at the spot and claimed it for the British Empire. The three men began the expedition to the South Magnetic Pole in a motor car specially adapted for the cold conditions, but abandoned it when it proved useless on soft surfaces. They then walked a total of 1260 miles to reach the South Magnetic Pole while pulling sledges and supplies that weighed approximately 670 lbs. Walking on foot across the coldest place on earth was perilous, and the men faced many dangers such as falling in concealed snow crevasses and acquiring frostbite and snow-blindness. Fearing starvation, they strictly rationed their biscuits down to the crumbs, and hunted seals and penguins. However, there is now some doubt as to whether their location was correct. The approximate position of the pole on 16 January 1909 was 72°15′S 155°09′E﻿ / ﻿72.25°S 155.15°E﻿ / -72.25; 155.15. The South Magnetic Pole has also been estimated by fits to global sets of data such as the World Magnetic Model (WMM) and the International Geomagnetic Reference Model (IGRF). For earlier years back to about 1600, the model GUFM1 is used, based on a compilation of data from ship logs. Earth's geomagnetic field can be approximated by a tilted dipole (like a bar magnet) placed at the center of Earth. The South Geomagnetic Pole is the point where the axis of this best-fitting tilted dipole intersects Earth's surface in the southern hemisphere. As of 2005 it was calculated to be located at 79°44′S 108°13′E﻿ / ﻿79.74°S 108.22°E﻿ / -79.74; 108.22, near the Vostok Station. Because the field is not an exact dipole, the South Geomagnetic Pole does not coincide with the South Magnetic Pole. Furthermore, the South Geomagnetic Pole is wandering for the same reason its northern magnetic counterpart wanders. ^ a b c NOAA National Geophysical Data Center. "Wandering of the Geomagnetic Poles". Retrieved 10 October 2011. ^ "Geomagnetism Frequently Asked Questions". NGDC. Retrieved 11 January 2009. ^ "Geomagnetism, North Magnetic Pole". Geological Survey of Canada. Natural Resources Canada. Archived from the original on 26 March 2010. Retrieved 11 January 2009. ^ World Data Center for Geomagnetism, Kyoto. "Magnetic North, Geomagnetic and Magnetic Poles". Retrieved 3 July 2012. ^ "Poles and Directions". Australian Antarctic Division. 2011. Retrieved 11 October 2011. ^ "FAQs from primary schools - British Antarctic Survey". Antarctica.ac.uk. 11 March 2011. Retrieved 9 November 2012. ^ Antarctica: Great Stories from the Frozen Continent. Reader's Digest. 1985. pp. 178–179. ISBN 978-0949819642. ^ "The Magnetic South Pole". Ocean Bottom Magnetology Laboratory. Woods Hole Oceanographic Institute. Retrieved 11 October 2011. ^ Jackson, Andrew; Jonkers, Art R. T.; Walker, Matthew R. (2000). "Four centuries of geomagnetic secular variation from historical records". Philosophical Transactions of the Royal Society A. 358 (1768): 957–990. CiteSeerX 10.1.1.560.5046. doi:10.1098/rsta.2000.0569. ^ "Geomagnetism Frequently Asked Questions". Ngdc.noaa.gov. Retrieved 9 November 2012. Barton, Charles (2002). "Survey tracks current position of South Magnetic Pole". EOS. 83 (27): 291. doi:10.1029/2002EO000210. Jules Sébastien César Dumont d'Urville was a French explorer, naval officer and rear admiral, who explored the south and western Pacific, Australia, New Zealand and Antarctica. As a botanist and cartographer he gave his name to several seaweeds, plants and shrubs, and places such as d'Urville Island in New Zealand. Earth's magnetic field, also known as the geomagnetic field, is the magnetic field that extends from the Earth's interior out into space, where it interacts with the solar wind, a stream of charged particles emanating from the Sun. The magnetic field is generated by electric currents due to the motion of convection currents of molten iron in the Earth's outer core: these convection currents are caused by heat escaping from the core, a natural process called a geodynamo. The magnitude of the Earth's magnetic field at its surface ranges from 25 to 65 microteslas. As an approximation, it is represented by a field of a magnetic dipole currently tilted at an angle of about 11 degrees with respect to Earth's rotational axis, as if there were a bar magnet placed at that angle at the center of the Earth. The North geomagnetic pole, currently located near Greenland in the northern hemisphere, is actually the south pole of the Earth's magnetic field, and conversely. Adélie Land is a claimed territory on the continent of Antarctica. 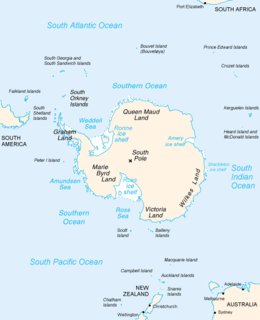 It stretches from a coastline area along the Great Southern Ocean inland all the way to the South Pole. 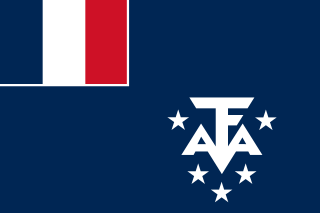 France administrates it as one of five districts of the French Southern and Antarctic Lands since 1955 and apply the Antarctic Treaty System rules since 1961. Article 4 deals with territorial claims, and although it does not renounce or diminish any preexisting claims to sovereignty, it also does not prejudice the position of Contracting Parties in their recognition or non-recognition of territorial sovereignty. France has had a permanent station in Adélie Land since April 9, 1950. The current Dumont d'Urville Station has a winter population around 33, but this goes up to about 78 during the Antarctic summer. Polar drift is a geological phenomenon caused by variations in the flow of molten iron in Earth's outer core, resulting in changes in the orientation of Earth's magnetic field, and hence the position of the magnetic north- and south poles. Skelton Glacier is a large glacier flowing from the polar plateau into the Ross Ice Shelf at Skelton Inlet on the Hillary Coast, south of Victoria Land, Antarctica. The North Magnetic Pole is the wandering point on the surface of Earth's Northern Hemisphere at which the planet's magnetic field points vertically downwards. There is only one location where this occurs, near the Geographic North Pole and the Geomagnetic North Pole. The geomagnetic poles are antipodal points where the axis of a best-fitting dipole intersects the surface of Earth. This theoretical dipole is equivalent to a powerful bar magnet at the center of Earth and comes closer than any other model to accounting for the magnetic field observed at Earth's surface. In contrast, the magnetic poles of the actual Earth are not antipodal; that is, the line on which they lie does not pass through Earth's center.